It’s Bald Eagle Festival Time! 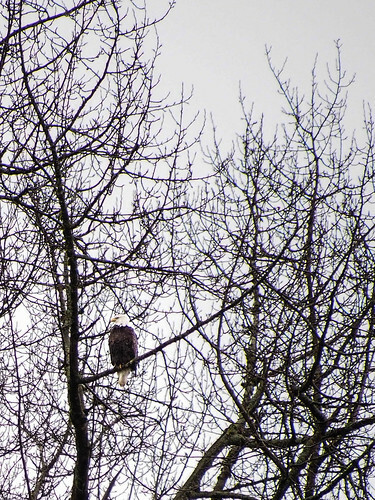 Every December and January, both bald eagles and birdwatchers head to the Skagit river. The eagles come from as far away as Alaska to feed on the carcasses of spawned salmon. At first light, the eagles head to the river to feed. They’re a talkative bunch and will make lots of noise calling to one another. After eating, they head to the skies. On clear days, they’ll go exploring. On grey and rainy days, they’re more subdued and tend to hunker down in nearby trees. Those are the best days to go eagle watching. Growing up in Virginia, in the aftermath of DDT, I thought seeing a bald eagle in the wild was a once-in-a-lifetime treat. On the Skagit in winter, you can see several at each bend in the river. Alas for my photography, this is the closest I could get to an eagle. We stopped on the side of the road on the way home for this shot. I didn’t know all of this before Saturday. Friday night, all I knew was the address of the Bald Eagle Interpretive center in Rockport, WA. That, and that they have guided nature walks each Saturday at 11:00 in December and January. Everything else I learned from Bob, the retiree who generously lead us on our walk through Howard Miller Steelhead County Park, who brought his own spotting scope and tripod, and who set it up low to the ground especially for Alex and Patrick after everybody else had left. I love volunteers. I learned a few other things from Bob. For instance: The salmon run was two weeks earlier than normal this year, so most carcasses had already washed far downriver. The eagles follow the carcasses. Ergo, there was not a single white feather to be seen in Rockport. (For the kids, Bob trained his spotting scope on a Great Blue Heron. And we did see one immature bald eagle — all brown feathers — flying low overhead as we walked back to the car.) We drove through two hours of rain and walked through a half a mile of mud for eagles, and all we got were spindly-legged frog fishermen that we can see in abundance 15 minutes from our house. What?! Patrick is not impressed with the wildlife. 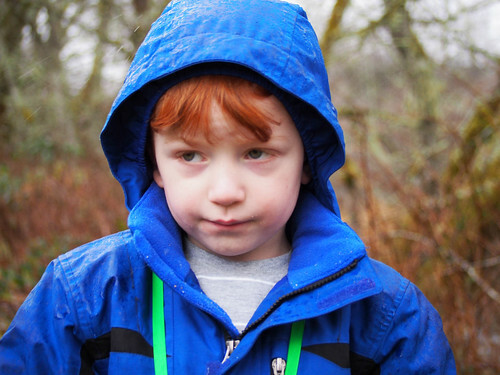 To salvage the trip, we headed 8 miles up Highway 20 to the town of Marblemount to grab some lunch and check out the fish hatchery… supposedly a good stop for kids, and another place to spy some eagles. Well, let me tell you about Marblemount. In the winter, this town is literally the end of the road. As you approach, you’re first greeted by roadsigns telling you this is your last chance for services for 76 miles. Then, you’ll see the signs telling you that Highway 20 is closed for the winter in another 30 miles. This is it… a dead end. The town, when you get to it, is a post office, the fish hatchery, and 10 storefronts, 8 of which are closed for the winter. And you know what? Marblemount was awesome. 1 of the 2 open storefronts was a restaurant that served huge portions of burgers, grilled cheese sandwiches, and French Fries. It gave us the nourishment to continue our adventure. And the fish hatchery was delightful. Yes, it is a cold, concrete, industrial building. But like the Bald Eagle Interpretive Center, it too has a retiree volunteer, this time ready to share his passion of fish rather than fowl. The boys got to see salmon eggs, salmon fry, and a frozen 48-pound Chinook salmon that looked like a monster from the last ice age. 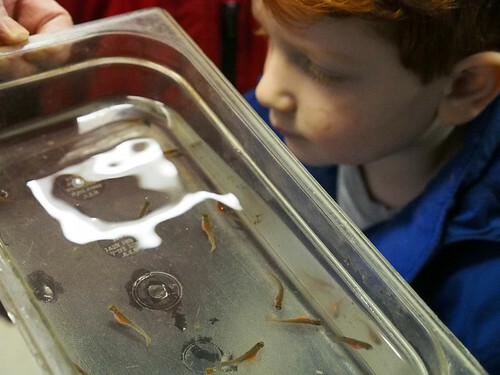 Newly hatched salmon. You can still see the yolk sac. A Chinook salmon caught by one of the hatchery workers. They put it in the freezer and bring it out for the tours. 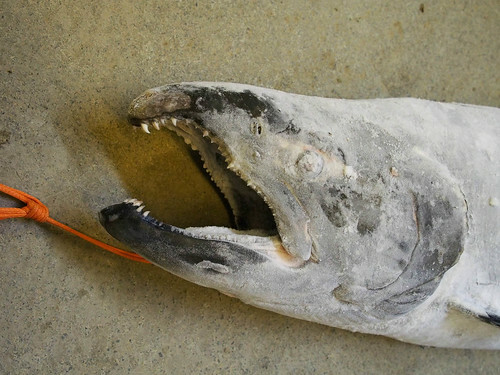 The teeth are terrifying in real life. In spite of setbacks, the Miracle of the Mountains made it a wonderful day. 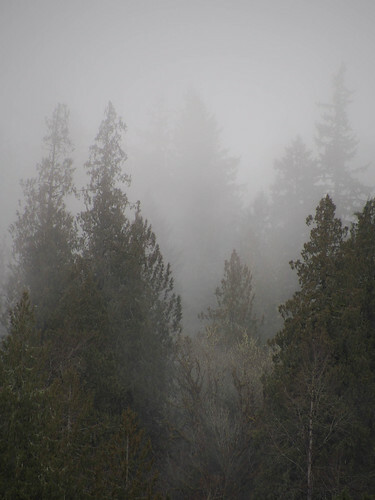 In the mountains, fog and mist are beautiful and mysterious. In the lowlands, that’s just dreary. On our way back to Seattle we drove through pockets of snow flurries and watched them swirl around moss-covered trees. In Seattle, it was just rain — part of the wet purgatory that will last until July. And as we headed downriver on the way home, I knew to look in the trees. I saw bald eagles at every bend. In the mountains, this isn’t dreary. It’s mysterious. The boys love spending time outside. 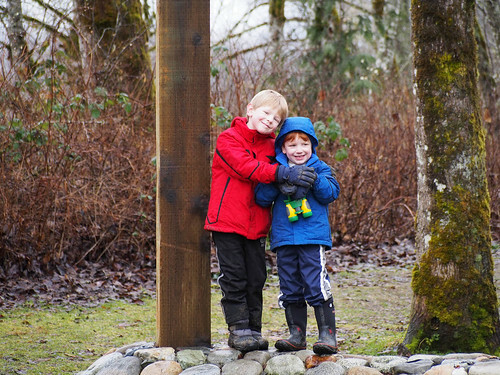 Here they are at the trailhead at Howard Miller Steelhead County Park.